You probably know at least one person who frowns in every picture, and who has mastered the art of concealing their teeth when speaking, laughing, and smiling. It’s unfortunate but many people would go to great lengths to keep their smiles hidden rather than seek out dental care. Dental phobia and fear of out of pocket treatment costs stops countless adults from having a smile they’re proud to share. If you’re the person with the closed-mouth smile in every family photo, let the caring Dentistry by Design team help. We offer numerous cosmetic dentistry solutions, and we’ll help you create a custom smile makeover plan that delivers a beautiful smile within your budget and schedule. Porcelain veneers are a simple, effective cosmetic solution for many patients. This one minimally invasive cosmetic service can completely transform your smile. 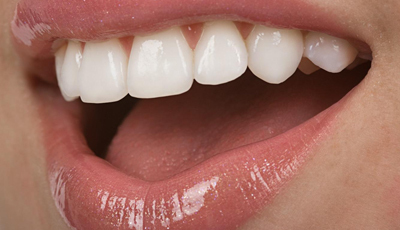 Veneers are thin sheaths of tooth-colored, dental grade porcelain. They are formed to fit over the front surfaces of the top, bottom, or both rows of teeth to conceal and correct cosmetic flaws. The high quality porcelain material is stain resistant, so this material is a great treatment option to ensure smiles remain flawless for years after porcelain veneer treatment. Patients who choose porcelain veneers should plan to visit our Bartlesville dental office at least two times for treatment. The first of the two appointments is longer. During this initial visit, we prepare the teeth that will be included by removing a small amount of surface level tooth enamel. Then, impressions are captured of the bite. A dental lab will use these impressions and our design specifications to craft flawless porcelain veneers. The dentist places a temporary to protect your prepared teeth between appointments. When your final restoration is received, you’ll return to our office. This shorter second appointment is simply an exchange of your temporary for the custom porcelain veneer. Most patients leave in less than an hour with a flawless smile. If you’re unhappy with any aspect of your cosmetic transformation, let the dentist know right away. We’ll do our utmost to adjust your veneer to ensure the results you desire. What Other Cosmetic Dentistry Options are Available? Our Bartlesville cosmetic dentist and team offer a wide range of cosmetic services. Porcelain veneers are not the right option for everyone, so before we begin treatment, you’ll need to visit us for a consultation appointment. During this initial visit, we’ll examine your smile, answer your questions, and help you create a personalized smile makeover plan. If you want to learn more about your cosmetic dentistry options, call our friendly dental team to get started today. We’ll be happy to answer questions and schedule a consultation.